You are currently browsing the daily archive for April 6, 2010. 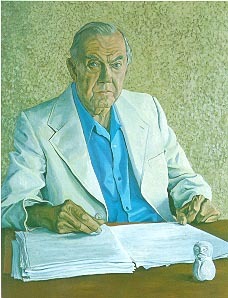 Graham Greene (1904-1991) by Anthony Palliser. One of the few pleasures of being unemployed is the opportunity to read. For the last couple of years I have not really had as much time for books as I would have liked, unlike in the old days when, as an academic, I could read at length and be quite content that I was merely doing my duty. Amongst the books that had piled up unread in recent days was a selection of the letters of Graham Greene which had been given me for Christmas. He is one of the few novelists of the latter part of the 20th century whom I thought qualified to be considered great though, given my old fashioned predilections, he had actually started writing well before the Second World War, like almost all those I admire. However he continued to create and to comment well into the modern world, and is perhaps the most distinguished literary exponent of the Cold War period. At the same time his writings are not just political, as are those for instance of John le Carre, another writer I much admire but whom I would not really describe as great. Unlike le Carre, Greene is always conscious of human dilemmas, and the capacity for error that complex situations precipitate for us and in us. The choices we need to make, both about fundamentals, and with regard to ordinary day to day relations, are the subject of his relentless but also very sympathetic analysis.